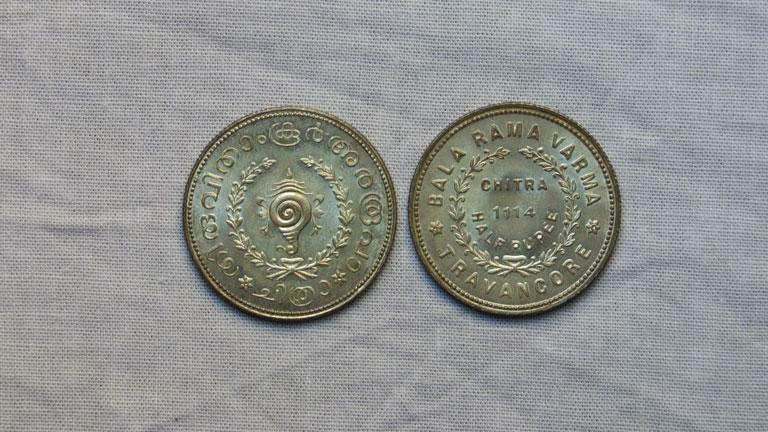 These are silver coins from the Kingdom of Travancore during the reign of Sri Chitra Thirunal Bala Rama Varma ( 1931 – 1949 CE). Obverse: Conch symbol is displayed within a floral design. Inscription in Malayalam: Thiruvithamcore Ara Rupa| Chitra is clearly depicted in the coin. Reverse: Within a floral design it is written as Chitra Half Rupee, 1114. Legend in English lettering “BALA RAMA VARMA TRAVANCORE” surrounds the floral design.